Hi everyone! Stop over at Ambar's Thoughts through the 14th, to enter a giveaway for one of my necklaces, the Miranda Three Nut Necklace, the one in the top right of the ad above. Good luck! These tea-shirts are a perfect fit for my mug! 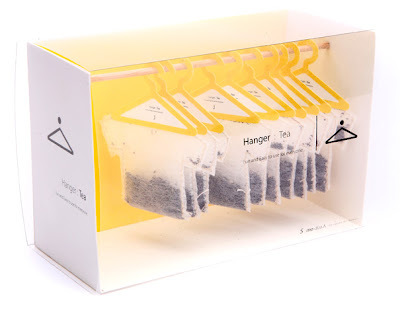 The top hook can twist to hang on the side of your favorite teacup, and the hangers are color coded for different varieties of tea. Maybe not for the tea-connoisseur who just has to have a loose-leaf, perfectly brewed beverage, but I think they're adorable! Now I need to work in an office building so that I can show them off around the coffee maker. 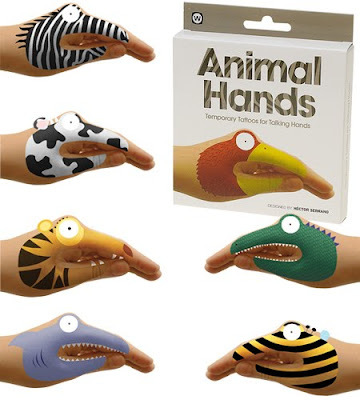 Shadow puppets are fun, but these are fun on steroids. Tattoos that are applied with water, these animals bring a new level of puppetry awesomeness. There are eight different animals in each set, including a shark, bee, tiger, alligator, and eagle. Serrano also has a set of monster hands featuring creepies such as a lizard creature and mummy. Let's give the toy a hand!